Want to share this article, We Pray for the Future on Huffington Post, written by a collegaue of an old friend who now teaches at the Anabaptist Mennonite Biblical Seminary. It is a good response to a very bad situation exploring some of the questions of the values of buildings and of national/political identity for Christians, especially as a minority. This should highlight that this is a complex situation, and like all significant conflicts, is not a simple two-party dispute. The article links to a site with a thorough documentation of the attacks with attempts to verify. I've reposted some of the twitter photos of a few of the churches below. Note that these three are Coptic churches, but other Christians of any denomination were targeted. The Cyprian frescoes displayed for the past 15 years on the grounds of the Menil Collection are on their way back to Cyprus. When offered the stolen frescoes in a sale, Dominique de Menil instead paid for their recovery on behalf of the Church of Cyprus in exchange for permission to display them for a period of time. That time has now expired and the frescoes have left the purpose-built chapel/museum/reliquary. Read the full story that will air later today on NPR. We will watch for plans for the building. Shigeru Ban designs another paper structure for the aid of natural disaster victims, this time a Cathedral in Christchurch, New Zealand. Photos of a wonderfully idiosyncratic building that is good example of gothic forms rendered entirely in wood. When your two year old comes to you bearing wooden blocks and says "buiwd a chuch, buiwd a chuch," how can you say no? A collection of photos of Breuer's St John Abbey, Collegeville taken during the 2010 Architecture Culture and Spirituality Symposium. Here are some quick teasers for three churches visited last weekend while in San Antonio for the Texas Society of Architects (AIA) convention. I'm working of posting more photos and writing descriptions & analysis of each of these, but I've been overwhelmed with other projects this week. First up, the chapel at the Haven for Hope which was dedicated last Sunday afternoon. 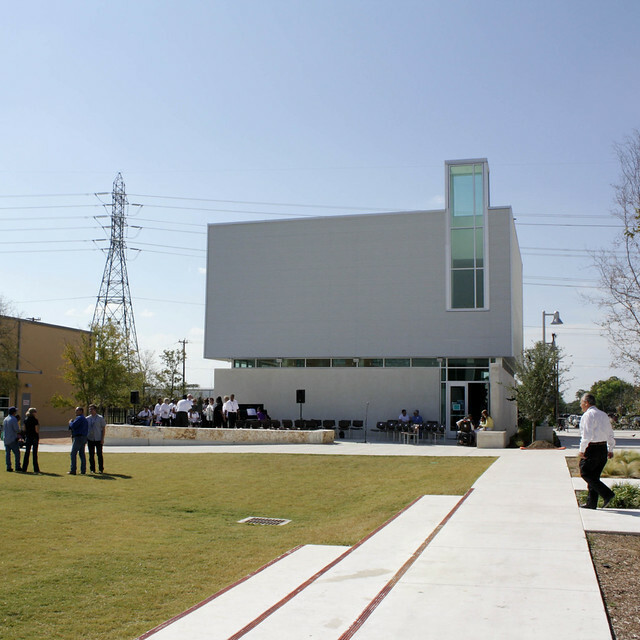 Haven for Hope is an incredible place built to serve and transform San Antonio's homeless population. The scope of the services and the number of organizations & service providers involved is an astounding display of what it means to serve the "whole person." The scale means that it can help everyone who seeks help, not just a few at a time. 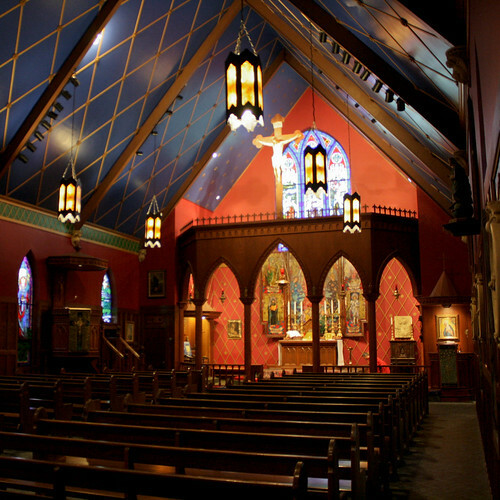 Overland Partners led the design team, including the design for the chapel pictured below. Next up is another campus chapel with a similarly profound & pivotal relationship with its site. 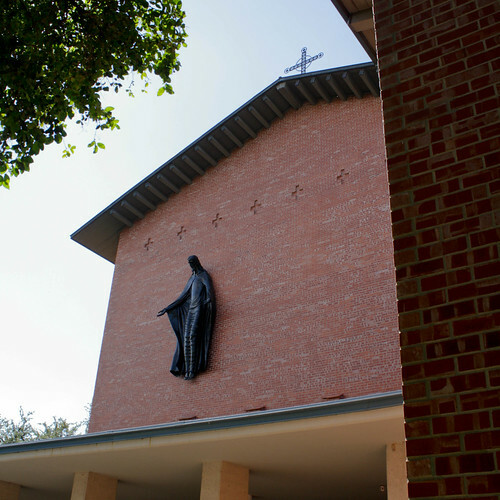 O'Neil Ford's chapel on the campus of Trinity University. And then in the evening we traveled out to the Anglican Use Roman Catholic parish Our Lady of Atonement, where the Sunday evening Mass is said in Latin from the (current) Roman Missal of Paul VI. I was hoping for some sign of "tradition sans traditionalism" but unfortunately no trace of that most desired grail was to be found here. The interior is fairly nice with greatest care in all the right places, though signs of cheap construction abound. The exterior is proportionally atrocious & tectonically inauthentic, but more on that later. On 21 November 2009 addressed a gathering of invited artists in the Sistine Chapel, echoing similar addresses by Pope Paul IV and Pope John Paul II. Photographs and analysis of the temporary structure built for the Beatification of John Henry Cardinal Newman during the Papal visit to the UK. Two more relatively obscure 1960s British churches of interest turned up the week on the flickr group Modern Churches of the UK: Epiphany, Corby and St Peter, Greenhill. Initial renderings for a temporary sanctuary for the beatification of John Henry Cardinal Newman. From the New Liturgical Movement blog, a poignant reminder of the relative insignificance of church buildings compared to their use. 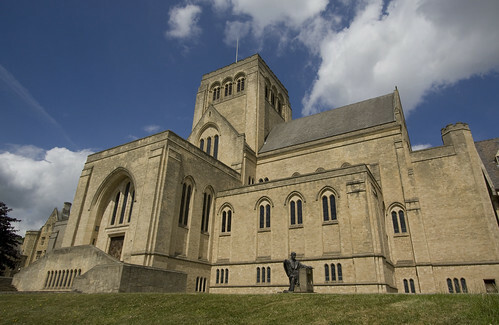 Our favorite Dominican photographer of churches, Brother Lawrence Lew, O.P., has an excellent description of Giles Gilbert Scott's Ampleforth Abbey Church on the New Liturgical Movement. I'd like to think this is one of those few 20th century churches to which none but the most curmudgeonly predisposed partisans would object. 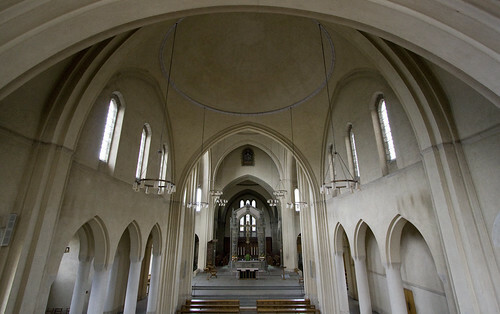 This church is ornate where it is fitting, minimal where appropriate resulting in an interior effective and focused. St Bernard of Clairvaux would be proud.